Hey, guys, it took me a while to decide if I should post in the main Manga Art Gallery or the Starter Gallery; to be safe, I'm just gonna post here. I was told forums were a great way to get some critiques by peers people of similar experience. I had a really long thing written here, but I forgot about it and restarted me computer . Anyways, I'm Goken here's some of my stuff; all of my stuff is traditional but I do want to try digital when I have the money! 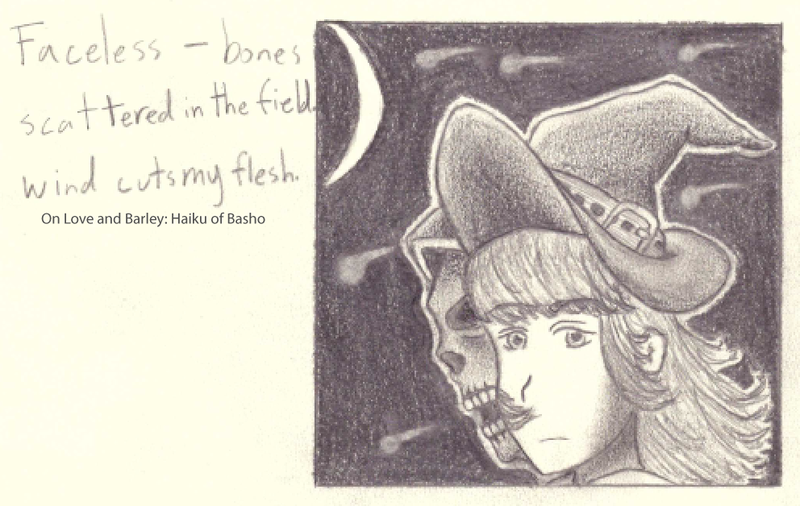 This project was to interpret a poem's line with a drawing that had to fit in a 4 x 4in. square. 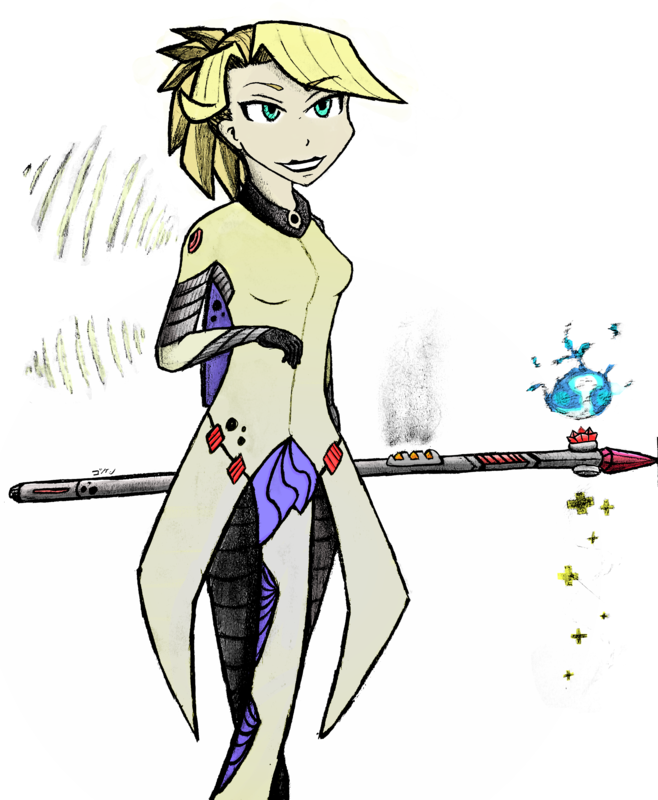 I was experimenting with different styles and came up with this, so this might not come off with a manga feel. I drew the head & hair and was planning on not finishing it but I thought she looked a bit like Mercy from Overwatch and though, "why not?" I used Photoshop to clean up my picture a bit and decided to see what it would look like colored. Yeah, exactly what I thought when I put it in Photoshop. I wanted to make it bigger on there, but wasn't sure how for the hand. I didn't notice the arm until you pointed that out, thanks! Better some start than none. I haven't messed around with digital in so long, pleh. Good luck if you ever get around to it. As for your current art, I am seeing some influences from American cartoon work and maybe something in the range of Trigger's studio. It's very stylized, although it looks like there are some areas where things look slightly off outside of style, like eyes looking crossed or, as BobbyJoe mentioned, the arms as opposed to the legs. Starting out, it's hard to see things this way, but it's a lot easier to develop a style after you have a grasp of fundamentals in reality. You can learn from other manga or art as a whole, but generally what makes you you comes from how you perceive and simplify life onto a page. Now, none of that is to say that what you have is some sort of terrible, incoherent, unfounded garbage. Your use of line thickness and the way you shade shows that you're starting to work your way around with graphite. For now, I'd definitely stick to that media for working out the ins and outs of what you want to do with what you want to present. Other media can be monstrously daunting. Get comfortable with where you're at, and then figure out what you want to work on, and once you decide on what small goal you want to pursue first, go for it. The hard part is figuring out those first few steps, because everyone has a lot that they can improve on. I can probably help a little more once you find a focus. Thanks for your input, man. I never took art seriously before until I switched my major to it, but it really is harder than it seems. Sometimes I find myself struggling to find poses that I can imagine in my head but can't find a reference photo for that pose, I was thinking of getting myself one of them posing mannequins, haha . Usually posing comes with time and understanding the shapes of the body in putting 3d onto a 2d piece of paper or screen. I do know the feeling of having difficulty with that kinda thing, since crossed legs still give me hell. I gotta say, as old and dusty as this advice is, practicing the basic shapes that go into anatomy in various positions will help with posing an entire figure later. Art is all about those baby steps. Roger that, up until recently I've always been afraid of diving into bodies, only drawing heads (and if I'm a little more adventurous, to the armpits, lol). I realize that eventually I'm gonna have to get to the body one day so I'm practicing all I can for the future! I was watching Little Witch Academia and wanted imitate the art, but I only drew the head. I came back one or two weeks later to continue the drawing. Before anyone asks, I don't know what she's holding, I just wanted so have her hold something . 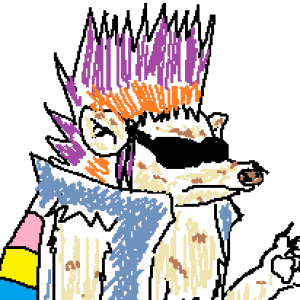 Hey guys, been pretty busy, but I did another drawing! 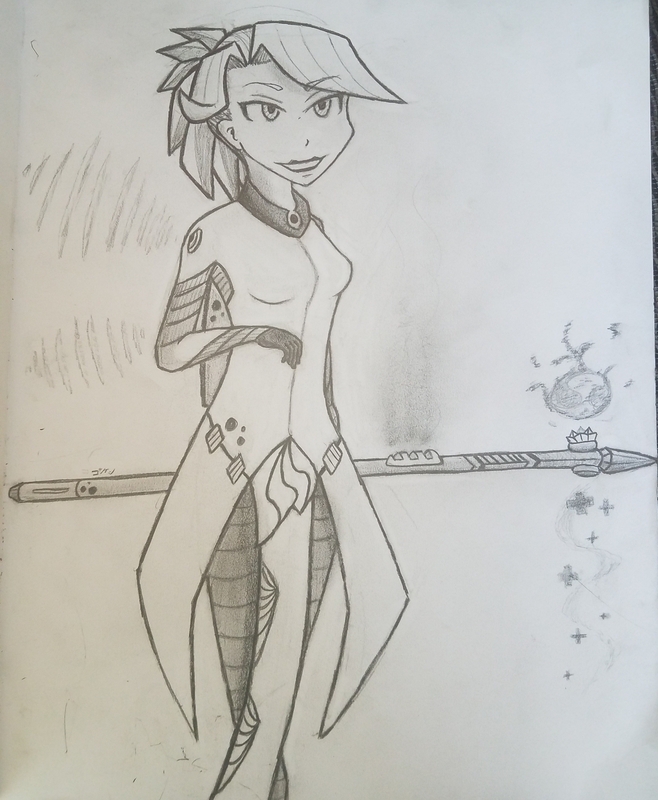 I drew this for my friend's birthday, it's not an original character but fanart. 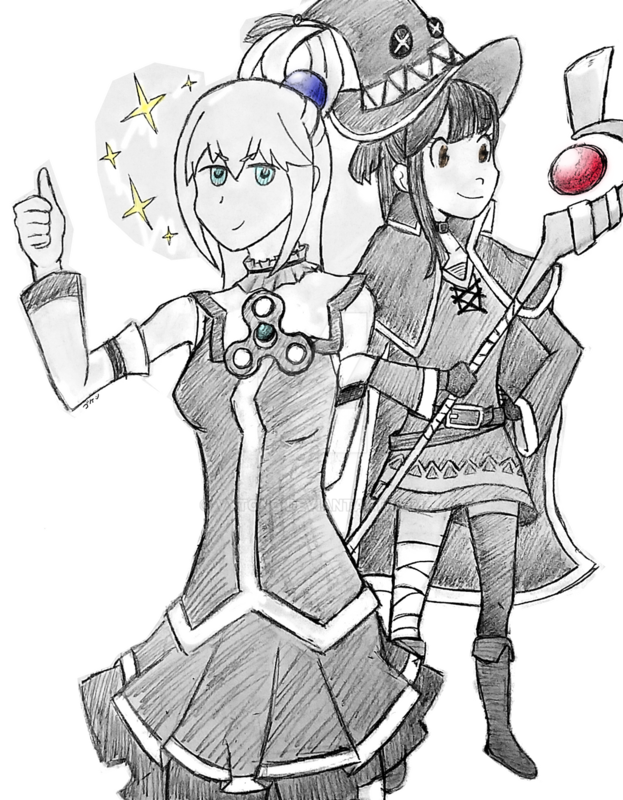 Aqua from KonoSuba and Akko from Little Witch Academia dressed up as Megumin in KonoSuba.